What makes the SODA HE 1.0 different? The HE 1.0 is designed to make data logging easy. It has all of the components need to measure and record environmental variables. It also has a unique power circuit to make batteries last a long, long time. 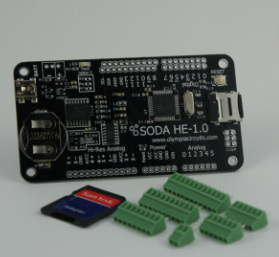 The SODA library let's you program the board for a data logging mission in just a few minutes. 4-channel differential input 18-bit ADC. Microchip MCP3424. 15 digital I/O channels. 5 channels can be used for 10-bit analog input. microSD card socket. SPI communication. Atmel ATMega32U4 running at 3.3V and 8 MHz. Features built-in USB communication. Is the SODA HE 1.0 Arduino Compatible? Yes, it is programmed in the Arduino IDE as a SparkFun Pro Micro 3.3V/8MHz board. It has the standard Arduino footprint with the Arduino Leonardo pin layout.